Those who shared their experiences have allowed me to share them on the blog. Anonymously. I continue to encourage everyone to come forward with their experiences, to talk about this problem openly because by remaining silent about it, we’re allowing it to continue; if you have a blog, please write about it and encourage others to do the same. If you don’t have a blog, find another platform that’ll share your story – whatever you do, please speak up. If you feel safe enough to do so, that is. Remember you can write anonymously, use a pseudonym, or ask a friend (or me or another blogger) to share your story. Here’s to praying for peace mental, physical, and emotional well-being of any and all who have experienced or witnessed sexual abuse (or any other form of abuse) in their lives. I wish for you strength and love – I’m sorry that our community mostly refuses to acknowledge the existence of this problem, especially when the perpetrators of the abuse is a religious community leader or someone else whom the community or our families trust, and I’m deeply sorry that there are few if any outlets that encourage us to talk about our experiences. It speaks to people’ strength that they have been able to go so far in life despite the efforts of sexual abusers who have attempted to break them in every way possible. A reminder to all those who have experienced sexual abuse: there’s nothing to be ashamed of, and it was not your fault – no matter your age, your life choices, what you were wearing, what setting you were in. It was not your fault, and you are not a bad person because of what happened to you regardless the extend or duration of the abuse. So far, I’ve published only one response, but the rest are coming up. I am really sorry that you had to suffer! Sexual abuse is not a “mistake” someone makes. It is a cruel, nasty, selfish act. A mistake is accidently setting the temperature on the oven to 400 instead of 325. Yes, people of all races and religions commit the crime of sexual abuse and none of them should be protected! I am so tired of having to be politically correct and hearing the media being politically correct. I want to hear the truth and find a way to protect the innocent and PUNISH THE GUILTY! May you find peace and healing. Thank you for your response, Tia! 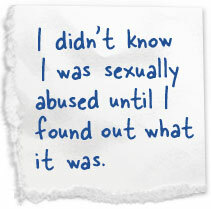 Indeed – sexual abuse is no mistake, and seeing it as such as a rather dangerous and cruel attitude. let the Malaikah of death showup. Usman Siddiqui, what a very annoying question. 🙂 And this under a post about sexual abuse, how dare you?.. A man would not want to marry ”us” because of feminist ideas? But we, woman, have to want to marry a man even though….. well, I don’t even want to finish my sentence. And I am happy no man would want to marry me if he can’t stand ”feminism”, lol.